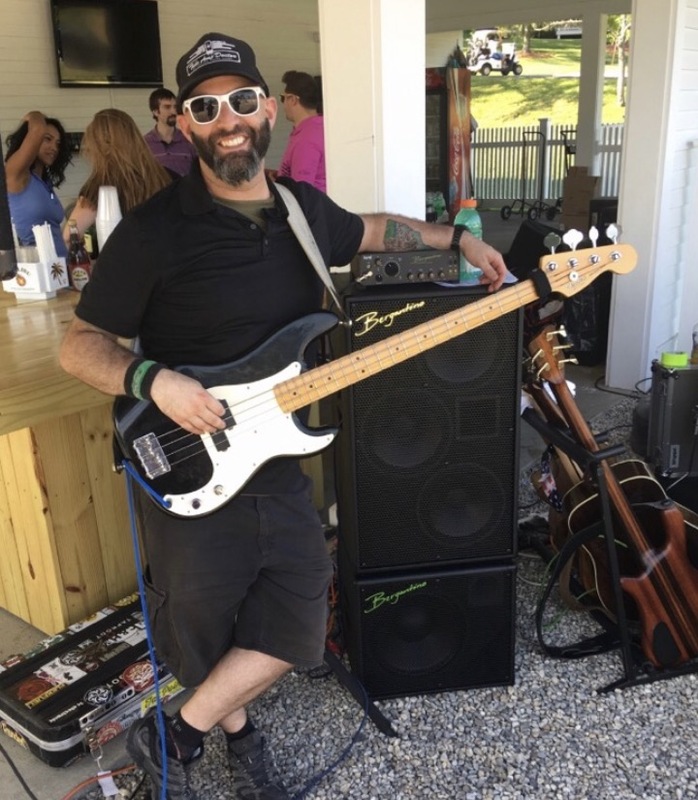 “Rick Eats Bacon” aka Rick Gauthier Jr. the bearded Bergantino Artist with the Super Colossal personality shares his bass story with us! How did you get interested in the bass and when did you start playing bass? Like so many others, I started out not desiring to play the bass. Most people from my generation remember how cool “Slash” looked with his Les Paul slung low, doing his ripping guitar solo standing on top of a piano with the spotlight on and his hair blowing back in the wind. Turns out I don’t have the hair to live that dream. I actually started off playing the drums and I was terrible at that. When I was in middle school I caused some trouble and got grounded….for a long time! My parents took my drums out of my room and the only thing I had left was this old guitar that we had bought for a buck at a yard sale. I taught myself how to play out of shear boredom. To be honest, I was pretty terrible at that too, but I enjoyed it. I played the guitar in different bands in middle school until I had a friend who needed a bass player. I wanted to play with these people and learned how to play the bass out of necessity for the sake of playing with this group. It just worked for me, and it wasn’t before long that I realized playing bass just connected with me. It turned out to be something I could do well. I felt comfortable, I felt like I belonged somewhere. You have been playing bass for quite some time now almost twenty years- how did you get here? Growing up, you hear people saying things like “find something you love to do and you will never have to work a day in your life”. I heard the words, but I never took the advice. I spent so many years playing bass as a hobby, and not a career. I was afraid if I relied on this for income, and it was not my choice, I would stop enjoying playing so much. I thought it would not be fun anymore if it became an obligation and I never wanted that fire to die for me. I spent many years working at a job that I hated and playing the bass on weekends just to make myself happy. When I hit my mid 30’s I thought “if I do this right I can make this a career”, and it will be the best time of my life. Ironically, I’ll be the first to tell the young kids that same advice. Do what you love. Make that what matters. As a musician in general I am probably the biggest Chris Cornell fan on earth. Unfortunately he passed away last year which was very sad. 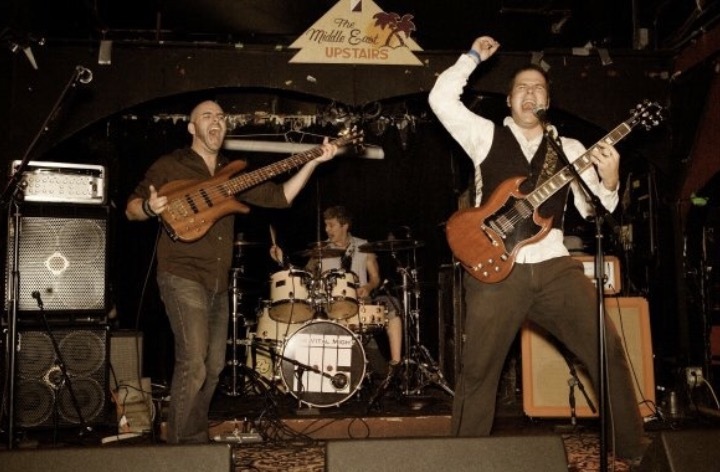 As a bass player, a couple of the top guys I look up to include Tim Commerford with Rage Against the Machine, Chris Wolstenholme from the band Muse, and Pete Connors from The States. I really like a lot of the extremely flashy stuff. A lot of the stuff Victor Wooten lays down completely blows my mind. The more I learn how to do borderline outlandish things the better I can get at everything. There are not going to be a lot of occasions where I could make practical use of those skills with the crazy all over the board slap stuff and the kind of wild stuff that Les Claypool does. Those things are impressive and amazing and learning how to do them will only make me better, but I find that if I work hard on stuff that I am terrible at, focus on what I don’t do well, I can get better at things that I am already good at (the basics, staying in the pocket, giving the song what it needs). I get a lot of influence from people and musicians who do things that are not particularly applicable to my world but I like going out of my comfort zone a lot, it helps me to figure out where I need to be. I taught myself. I picked up that cheap yard sale guitar that we got. I would hear things on the radio and just spend time figuring out how to match pitches and find the sound I was looking to find. I started with one note at a time. I followed the root of the songs. This was all before YouTube and internet were tools you could use to learn! I had to figure out how to get my fingers to cooperate and figure out the physical skills to get my right hand and left hand to cooperate with each other and to get the sound I wanted to hear. There’s just no substitute for putting the work in, spending the time with your instrument to really understand it inside and out. It’s a relationship. You can’t get more out than you put into it. You have to put those thousands of hours in behind the scenes. Are there musicians in your family? My father loves to tell the story of taking me fishing when I was young. I was a kid, I didn’t really get it, the appeal of fishing. I did love spending time with my dad and my brother out by the water. He’d work hard all week and be so happy to get out and relax with a fishing pole on the weekend. I was more interested in wrapping the hook back around the base of the pole and plucking the fishing line while changing the tension on it, trying to play songs on my fishing pole. My heart was in music before I knew what music would mean to me. My grandfather on my mother’s side was a fantastic guitar player as well. I have a very realistic view of what my role is in the world of music. I use my right hand to communicate with the drummer. I will match up and lock in with percussive things the drummer is doing and follow the bass drum as a root guideline. I communicate with the guitar player and singer with my left hand by finding the actual note. My style is whatever the band needs. Sometimes that means I am playing single notes at a time and staying very basic. Sometimes there is just a lot of space left to be filled into full chords and or melodically pull things apart a little bit to fill the space. My style changes depending on who I am playing with. A bass player’s role is to use your fingers to communicate with everyone around you and fill in the holes as needed. You need to listen more than anything else, figure out what the song needs, and adapt to the moment. What styles of music are your favorite to play? As I play bass professionally, I find myself spending a significant amount of time listening to music that I would not normally listen to. You have to learn songs for different bands and it’s like any other job in that way, some of the parts of the job you love and some you don’t. Every great job has tasks you won’t love. Sometimes you have to clean the toilet or wash the windows (which is how I view playing “Footloose”). I do like to play anything outside my comfort zone. I find that I am at my best when I am the most uncomfortable and I do my best work when I am the worst musician in a group because I HAVE to work harder. I am forced to bring my “A” Game and I do! What was the first bass you have ever owned? I picked it up in the late 90’s and it was a four string Ibanez ATK. Basically a MusicMan style bass with a single pickup. I own three basses currently-I always have a functional use for more than three but that’s what I currently have in rotation. My main instrument that I play 90% of the time is my Dingwall NG2. It’s a five string and by far the most comfortable and most versatile bass I have ever played. It is physically high quality enough to withstand being played every single day of the week and has every type of sound you could want in it. It has a Darkglass preamp onboard which is very strong, loud, and versatile. It has all of the different tone options for basic jazz, a MusicMan style Humbucker sound, a P neck type sound, and everything you could need in one package which is really cool. Being a multi-scale instrument the clarity you get out of this instrument is just unparallel. I’m a huge fan of these basses, and Sheldon Dingwall is one of my favorite people on earth. My second favorite is a semi vintage Fender “P Bass” that all bass players are required to have in your tool box! I run Labella flatwound strings and it has EMG pickups in it and is from the early 80’s. I use it for blues and country stuff. It has this really nice woody thud type of sound to it. If you really bite in hard with your right hand it gives you a very flat, cool, woody warm tone which I like a lot. It’s black with a white pick guard. The last one is a Warwick Streamer Stage 2 and I considered it my dream bass growing up. When I first started playing bass P nut from the band 311 and Dirk Lance from the band Incubus both used this bass. I always wanted to have that exact sound and I love the look of this bass. I saved up and traded up for this and got the holy grail of basses. I have so many memories with this bass touring the country and it never let me down. I’ve had this for a long time and it’s going nowhere. I also have a custom fretless being built by Simonetti Custom Basses. I am wildly excited about this one. 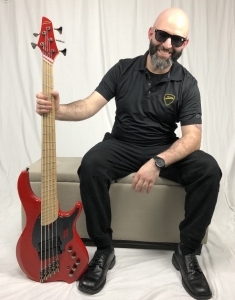 Ray Simonetti makes some of the highest quality basses I have ever played and I’m really beyond happy about this bass! How did you find out about Bergantino? Bergantino is one of those names, that within the industry it’s well known that this is one of the highest quality of products. There were not a lot of dealers around where I grew up and it wasn’t until I moved to Chicago at which I spent a lot of time working at Bass Club Chicago and had the opportunity to play every product down the line side by side and choose what was best for my ears. What I found with the side by side comparison is if you were to put a blindfold on and have someone play what you will find is with this product you get unparallel clarity and really true tone. No matter what bass you plug into a Bergantino amplifier you are going to hear that bass in its purest form. What I love about the Bergantino fortè and B|AMP is that what you hear is not colored…. It amplifies the instrument you are using in the clearest way possible. I find the same thing with Bergantino Cabs. Your products are clean, transparent, and beautiful. Some amps sound like the amp no matter what you plug in. That greasy SVT tone for example. That sound is the same playing a P or a Warwick or a Lakland. 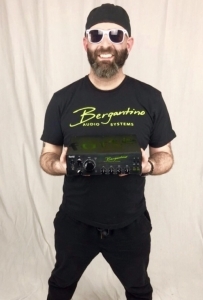 The Bergantino amplifiers let you sound like your specific instrument. You’ll hear your bass more clearly than you every thought possible. Pure, transparent, and clean. Tell me about the bands you have been with and who you are playing with now. I grew up in NH and recently moved back to NH to be closer to my family. What’s the one song you love to play the most? Social media seems to be a very large passion of yours? Social media has become an important part of the world and I enjoy the creativity of making something special out of it. I don’t spend a lot of time worrying about other people’s comments. I’ve realized that I have the ability to share my thoughts and network with other bass players and musicians that have many of the same passions that I do globally and have met some great people in doing so. I do not take for granted my position within the bass community. It’s more of an honor than I can explain to know that there people out there who want to advice from me. You can get great advice through the internet from others on product reviews, playing styles, etc. Some good examples are my friends Andy Irvine and Patrick Hunter. These guys in very different ways use the internet to help other musicians learn about new gear, and show pros and cons of each piece of equipment. “Rick Eats Bacon”- how did you get that nick name? For some reason in the US bacon has become a thing….. One of my best friends and I would have an annual bacon party starting about 10 years ago. Everything we had was bacon related. Between us we probably had 10 pounds of bacon at an event for 5 people. Some things worked and some did not. One of my friends froze bacon in ice cubes and we used in in our scotch. This was a really bad idea. We were bold! I am not unhealthy Harry here! I eat good food and just have fun with bacon! Nothing like the smell of bacon cooking! What advice do you have for fellow bass players out there? https://bergantino.com/wp-content/uploads/2019/01/bergantino-logo-green-white-RGB-300x80.png 0 0 Bergantino Audio https://bergantino.com/wp-content/uploads/2019/01/bergantino-logo-green-white-RGB-300x80.png Bergantino Audio2018-08-11 12:04:202018-08-11 12:17:14“Rick Eats Bacon” aka Rick Gauthier Jr. the bearded Bergantino Artist with the Super Colossal personality shares his bass story with us! Bergantino Artist Maurice Fitzgerald Bergantino Artist Rick Gauthier Jr.